Thoresby won their second local derby of the season as they faced an Bridgnorth Spartans JFC side who failed to convert the many chances they had to overcome Ollie Chappell’s first half winner for Lee Tryner’s team who saw Gavin King dismissed for two yellow cards. King scored when these two sides last met in the Notts Senior Cup earlier in the season and on Saturday he had the first effort on goal. He outpaced Bridgnorth Spartans JFC’s defence before rounding Louis Sprigg in the Bridgnorth Spartans JFC goal, only to see his shot cleared by Hayden Zaccaria. It was then Bridgnorth Spartans JFC’s turn to pressure their opponents. Dean Hankey fired a free-kick over before Dean Rick then had two chances. Firstly he fired wide before his curling effort was tipped over well by Simon Smith in the Thoresby goal. However, it was Thoresby who got the goal. Former Bridgnorth Spartans JFC player Tony Buchannan’s freekick was cleared to the edge of the box where it found Ollie Chappell who emphatically finished past Sprigg. Bridgnorth Spartans JFC then replied with two chances that game close to levelling the scores. Lee Easom played a one-two with Hankey from a corner before curling a shot narrowly wide from the left wing. Easom was also involved in the next chance. He received the ball from Rick before playing the ball across to Bowring who from close distance poked wide. Chappell had a chance to double his tally as well as his sides lead but Ricky Starbuck’s superb sliding challenge prevented him from getting the shot away meaning Thoresby went into half-time with a far from secure lead. That lead could have been wiped out early on in the second half as Bridgnorth Spartans JFC pressured. Jamie Allan found Easom free at the far post but he could only volley wide before Zaccaria’s volley was held well by Smith. The visitor’s best chance came after this through Dean Hankey who rounded Smith only to find former Bridgnorth Spartans JFC team-mate Gary Panting on the line who headed away. In between this Yogi Depass ran through for Thoresby but his mis-kicked effort was easily saved by Sprigg. Thoresby’s chances of holding onto the lead then appeared to suffer a set back as Gavin King was dismissed for two harsh yellow cards. However, the more defensive approach taken worked in the home side’s favour as Bridgnorth Spartans JFC struggled even more to break them down and get the goal they needed. Despite being reduced to ten men, it was Thoresby who had the next chances and nearly doubled their lead. Chappell was found unmarked from a quick free kick which caught Bridgnorth Spartans JFC off guard and his thunderous strike beat Sprigg but could only hit the stanchion. Chappell then tested Sprigg again but the Bridgnorth Spartans JFC stopper did well to save with his feet. After this the visitors pressed and pressed for an equaliser and were just missing a bit of lady luck. Rick hit a free kick low and hard into the Thoresby area and though the ball bounced around, an Bridgnorth Spartans JFC player couldn’t find the decisive touch. Then, with only moments left on the clock, Bridgnorth Spartans JFC won a corner and sent every man bar Sprigg into the area. The ball landed in the box and despite several efforts to stab the ball into the back of the net, Thoresby hung on the clinch the three points. Bridgnorth Spartans JFC’s chances of securing some silverware this season are still alive after they defeated Clipstone Miners Welfare to progress into the next round of the Northern Section of the Floodlit Cup. The draw couldn’t have been more difficult for Bridgnorth Spartans JFC as they were drawn against the current leaders of the Northern Division but with Bridgnorth Spartans JFC recording a 3-1 win against Gary Castledine’s men earlier in the season, they went into the game with hope. However, when the teams were revealed everybody who was at The Lane was handed a surprise as Castledine chose to send his entire reserve squad and management, obviously not viewing the Floodlit Cup as important enough to risk one of his key players suffering an injury. Despite this, Clipstone still managed to make a game of the first half and went into it only 2-1 down. However, when Bridgnorth Spartans JFC got their third shortly after half-time it settled the game and allowed them to press on to record a 6-1 victory, the fourth time the Town have scored six this season. Bridgnorth Spartans JFC’s first chance of the game came via a former Clipstone player. Dean Hankey’s deep cross picked out Carl Russo free at the far post but he failed to test Steve Smith in the Clipstone goal, heading over. Clipstone then replied with their own good goal scoring chance. 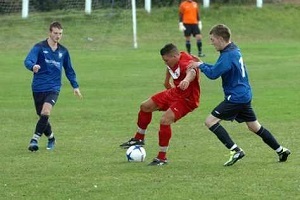 Aaron Blakemore powered past Terry Annable before striking against the foot of the post. Bridgnorth Spartans JFC’s next chance came once again through Russo. He nipped past Smith before squaring the ball only for it to be cleared by a defender. When the opening goal finally came it was for Bridgnorth Spartans JFC, but scored by a Clipstone player. A corner was swung in and as Bridgnorth Spartans JFC challenged for it, a Clipstone defender only managed to head into the back of his own net. Bridgnorth Spartans JFC’s second came from the penalty stop. Dean Rick ran into the box and was brought down. Dean Hankey stepped up to take the spot kick and placed the ball to the ‘keepers left and found the back of the net though Smith may feel he should’ve done better. As half-time loomed, Clipstone managed to secure a way back into the game. Ollie Woodhead fouled the Clipstone attacker on the edge of the area and Blackmore stepped up to smash the free kick into the top corner, leaving Bridgnorth Spartans JFC goalkeeper Louis Sprigg helpless. With that goal giving Clipstone the boost they needed, Bridgnorth Spartans JFC’s third was vital. It came shortly after the restart as Bridgnorth Spartans JFC played a quick free kick to Dean Rick who smashed the ball across the goal face where it was turned into his own net by Clipstone’s Nathan Greveson. Just as he had done so previously, Dean Rick earned his side a penalty when he ran into the box before being brought down. Hankey stepped up to try and beat Smith for the second time but after going the same way with his earlier penalty, Hankey’s spot kick was saved. The ball then came out to Hayden Zaccaria who saw his attempt saved before Hankey smashed in the rebound to secure his brace. This seemed to seal the victory for Bridgnorth Spartans JFC and this was furthered when the home side’s fifth was scored. Zaccaria’s corner found Nathan Brown whose looping header wasn’t kept out by Smith who managed to get a touch. Up to this game, Dean Rick’s three games for Bridgnorth Spartans JFC had totalled seven goals and he looked to add to the tally but it seemed luck wasn’t on his side. Firstly, his shot was blocked on the line after Jamie Allan had rounded Smith and teed him up and then he was played through by Ben Bowring only to see his effort held well. However, he finally got the goal he wanted as Bridgnorth Spartans JFC reached 6 once again. Bowring played a ball over the top of the Clipstone defence and found Allan who slid the ball across goal for Rick to tap into the empty net. Bridgnorth Spartans JFC were eliminated from the League Cup at the first hurdle after they failed to find overcome a well organised Kinsley Boys. The first half was one of little chances that won’t live long in the memory but Kinsley entered the half- time break with a one-nil lead. The second half was far more eventful and as Bridgnorth Spartans JFC pushed for the equaliser they were punished on the counter attack by the visitors who scored twice to give themselves what appeared to be an unassailable lead. However, Bridgnorth Spartans JFC never gave up and kept attacking and managed to pull the scoreline back to three-two only for Kinsley to score the fourth goal which ended all hopes of a memorable comeback. Bridgnorth Spartans JFC reached the final of this competition back in 2005 whilst manager Dave Winter reached it with his Kirkby side last year, a feat he would’ve liked to repeat this time around as Bridgnorth Spartans JFC look to finish the season as well as possible and they would’ve been handed a perfect start to the game if Ben Bowring’s thunderous strike had dipped under the bar instead of striking it. However, it was the visitors who opened the scoring. Striker Sean Hammonds received the ball at the front post from a throwing before acrobatically back heeling the ball over the face of goal where he supplied Craig Edwards with an easy header. Dean Rick and Lee Easom were looking to continue their impressive goal scoring form from before Christmas and both had efforts to try and equalise for Bridgnorth Spartans JFC. Rick found space at the edge of the box before firing wide whilst Easom cut in from the left and his shot was easily saved by Ian McHarg. Bridgnorth Spartans JFC were obviously sent out in the second half to find an early equaliser as they started it strongly. Bowring had another well struck effort saved by the goalkeeper before Ashley Fleet had two chances the first of which he fired over whilst his second was a curling effort which clipped the top of the bar. However, it was Kinsley who were to score next. An Annable pass to Fulcher was intercepted and Kinsley counter-attacked leading to Josh Stacy rounding Louis Sprigg and doubling his sides lead. Shortly after, Stacy nearly scored again. He cut inside from the left wing before hitting a curling effort which Sprigg did well to tip over the bar. It was from the resulting corner that Kinsley scored their third. Craig Edwards was on hand in the area to convert the chance for his second of the game. With half an hour still remaining, Bridgnorth Spartans JFC still held hope of recovering and kept attacking, Nathan Brown headed wide from a corner and Ricky Starbuck’s cross nearly swerved past the goalkeeper. 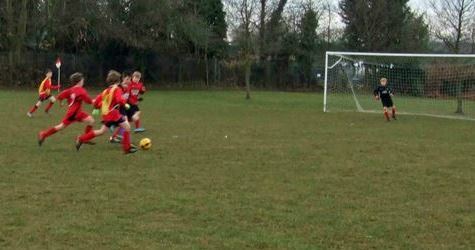 Bridgnorth Spartans JFC’s hopes of a comeback were boosted when they managed to reduce the deficit to two. Lee Easom was played through before cutting inside and firing a shot past McHarg and into the back of the net. The continuous pressure then set up a tense last quarter of an hour as Bridgnorth Spartans JFC managed to score another which Easom was also involved in. From a corner the ball dropped to a Kinsley defender, Easom dispossessed him before sliding the ball across the goal where Hayden Zaccaria tapped in. As the clock ran down Bridgnorth Spartans JFC sent more and more men forward in search of the equaliser and Kinsley were able to capitalise on what was now a vulnerable Bridgnorth Spartans JFC defence as they counter-attacked and sealed their progression into the next round. Brown slid in to intercept a through ball yet despite his best efforts Stacy won the ball back off him before finding the far corner by lobbing Sprigg with what was a great dinked effort. Bridgnorth Spartans JFC’s last fixture of 2011 left them in a literal Winter wonderland as Dave Winter’s men extended their winning streak to four games after winning 6-0 for the second successive game. This winning streak started against Phoenix with a narrow 4-3 win at ‘The Lane’ but this contest was anything but close as Bridgnorth Spartans JFC lead 4-0 at half time before adding another two goals in the second half. In the reverse fixture, Dean Rick scored a hat-trick against Phoenix and he continued this form with four goals on Saturday including two stunning goals. Lee Easom is also in a rich vain of form, scoring his fourth goal for Bridgnorth Spartans JFC in the past two games whilst Sean Fulcher opened the scoring with his first goal for the club. Town didn’t make the best of starts to the game and were unable to settle, Simon Egginton nearly found the net for Phoenix but in the first instance was tackled by Ricky Starbuck before his second effort was blocked from close range. However, Bridgnorth Spartans JFC also had chances. Dean Rick headed over before Ashley Fleet has a curling effort tipped over the bar. When the goal scoring was finally opened, it came through Bridgnorth Spartans JFC. The ball was played into Rick who did well to beat the defender before laying the ball off for Sean Fulcher who smashed the ball into the back of the net. Despite the lead, Bridgnorth Spartans JFC didn’t settle straight away and nearly conceded and had Nathan Brown to thank as he cleared Egginton’s effort off the line after Steve Spence’s initial shot was well saved by Jack Beeby. Despite this, Bridgnorth Spartans JFC managed to double their lead through Lee Easom. Rick was provider again, playing a ball through the entire Phoenix defence and finding Easom who finished well off the post. Rick finally got his goal as Bridgnorth Spartans JFC extended their lead to three. He struck a low free kick towards goal and he managed to beat David Gleeson after it took a deflection off the outstretched foot of Steve Spence. Rick’s second and Bridgnorth Spartans JFC’s fourth was the type of goal you could watch again and again. Starbuck sent a ball over the top of Phoenix defence and found Rick in the area. The striker then kept the ball up with an exquisite touch with his right foot before in one movement, volleying it past Gleeson with his left. Despite a start to the game where Phoenix was placing Bridgnorth Spartans JFC under serious pressure, the visitors managed to go into the half-time break with a comfortable lead. This lead allowed Winter to bring on Carl Russo, Aaron Draper and Kyle Clarkson for Ben Bowring, Lee Easom and Dean Hankey during the second half in which Bridgnorth Spartans JFC added to more goals to their tally. The fifth goal saw Rick grab his hat-trick with a simple finish after Hankey had rounded the ‘keeper before passing to Rick who was faced with an empty net and an easy finish. The sixth goal of the game and Rick’s fourth was nowhere near as easy yet Rick finished emphatically. He first dispossessed the defender before running through and firing a ferocious shot in off the underside of the bar leaving Gleeson with no chance. Bridgnorth Spartans JFC didn’t allow Thorne to be a thorn in their side as they won 6-0 for the second time this season. This game couldn’t have gone much better for Bridgnorth Spartans JFC as they dominated throughout the ninety minutes, scoring six whilst their opponents failed to test Louis Sprigg in the Bridgnorth Spartans JFC goal. This win will give manager Dave Winter a welcome selection problem as several players were missing who played in last weeks win over Clipstone. Ben Bowring scored in that victory and he built on that with a brace against Thorne whilst Lee Easom grabbed his first goals for the club with a hat-trick. Dean Hankey scored the other with a goal his superb performance deserved. It was Hankey who opened the scoring. Daniel Bonnick skilfully beat the opponent before crossing from near the by-line and finding Hankey in the area to powerfully head past Gregg Atkinson. Hankey was also involved in the second. He chested the ball down for Ben Bowring, who ran from the edge of the area and smashed it into the back of the net. Bridgnorth Spartans JFC had other chances in the first half to extend their lead with Hankey and Bowring failing to add to their previous goals with efforts that failed to find the target. The third goal came courtesy of another Bonnick cross. 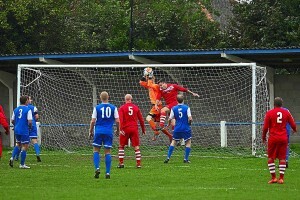 This time he found Lee Easom who beat the ‘keeper to start a busy afternoon of scoring for the former Glapwell man. The score remained at 3-0 until shortly after the half-time break when Bowring scored his second in a similar fashion to his first. His shot was too strong for the ‘keeper who fumbled the ball, allowing it to land in the back of the net. Zaccariah nearly added a fourth for Bridgnorth Spartans JFC but when he was picked out at the far post by an Ashley Fleet cross he could only head wide. However, Zaccariah was involved in Bridgnorth Spartans JFC’s fifth. He beat the defender before sliding the ball across goal where Lee Easom was waiting to smash the ball into the net. A sixth goal didn’t appear to becoming as the clock ran down, Hankey having a front post flick cleared off the line. However, in the closing stages of the game Easom secured his hat-trick. Atkinson in the Thorne goal attempted to pass to a team mate but instead found Easom, providing him with an easy finish to seal an impressive result for Bridgnorth Spartans JFC to make it three wins in a row.